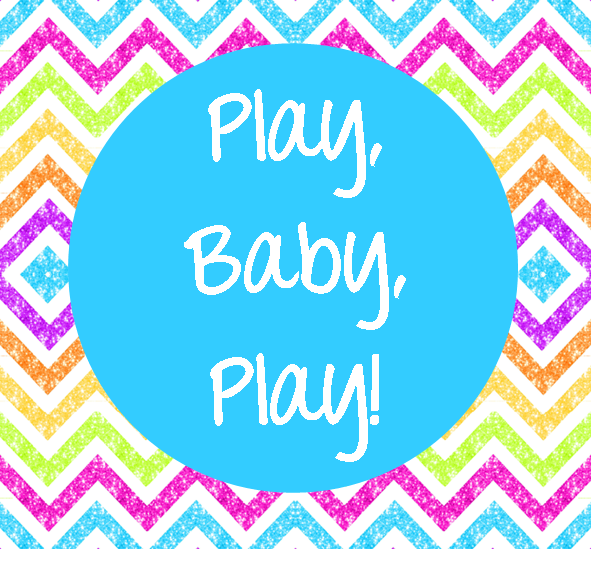 Play, Baby, Play! – Paper Everywhere! Kendra has also blogged about this process, but it's so much fun that I decided to steal her idea again. Seriously, if you do nothing else this summer, bring this out at least once in your storytime. I did it last summer and parent's still talk about it! It will definitely be making another appearance this year. First, you need to get a bunch of shredded paper. Make friends with your business manager, or simply take out all those papers in your file cabinet that you're never ever going to use. You know the ones I'm talking about. The person before you wrote out every program they did by hand and you've never looked at them. Give them a second life in this program. After getting a good amount of paper, you need to make sure you have the cleaning up supplies ready. Get a vacuum, a broom, and a dust pan. Find a sweet naive volunteer if you're very lucky. Do your normal storytime jam (or make it all about the parachute if you'd prefer), and then tell the parents you're going to get crazy. Warn them that it will be a total disaster area, but you don't mind the mess and you just want people to have fun. I always encourage parents that this is something that they would most likely never do at home (unless they're really cool), so they should take full advantage of it here. I lay out the parachute, get everyone to gather around, and then warm everyone up. 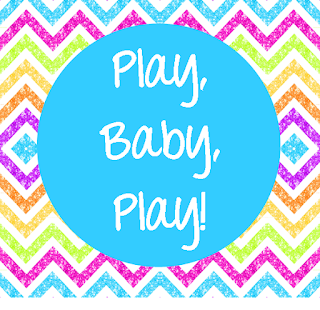 We do a round of peek-a-boo, Itsy-Bitsy Spider, and Row, Row, Row Your Boat– then I dump out the paper. Then it becomes a total frenzy. You can sing another song if you want, but I choose to skip it. I just let everyone play with the parachute without instruction. After about 10 minutes of shaking and shrieking (the good kind), parents laid the parachute down and kids starting just playing with the paper. We had one kid playing "SURPRISE" with the paper. A great game where you grab as much paper as your tiny hands will hold, throw them in the air, and yell "surprise". This was definitely a crowd favorite. We had kids who wanted to see how much paper they could put on their head and their entire bodies. I had a parent come back a week later and say she found handfuls of paper in both her child's pockets and her own. After 30 minutes of chaos, I had to shoo everyone out so I could do a quick clean-up for my next storytime. I did the best I could and the next session came. After a great time was had by all, I started the real clean up. It took about an hour to clean up the entire room. It was totally worth it. So, why do we do a program like this? Using the parachute is a great way to build those core muscles, Grabbing tiny shreds of paper improves fine motor skills. The "SURPRISE" game involved imaginative storytelling because it eventually became all about a surprise birthday party. Also, it's just a lot of fun. At La Crosse Public Library, we have a rocking Summer Reading Program. We typically sign up around 1,500 kids of varying ages and we have 3 different programs to choose from. One for preschoolers (anyone under the age of 4), elementary school kids (up to 5th grade), and teens (6th grade and up). When I first came to La Crosse we did The Rubber Ducky Club. 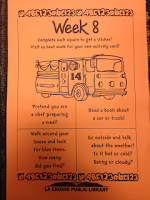 A handout was given to caregivers with 6 early literacy activities on it and they were encouraged to come back at the beginning of the month for another sheet and a rubber ducky. While this is a great program, it had been the same format for three years in a row and was starting to feel stale. I knew that next summer I wanted to make some changes. Last year, instead of having preschoolers and their caregivers visit us once a month, I decided to make a fun game card encouraging two visits each month. On each visit they received a rhyme card to add to their collection. They qualified for a book after two visits, and usually we would see a drop in participation after that. 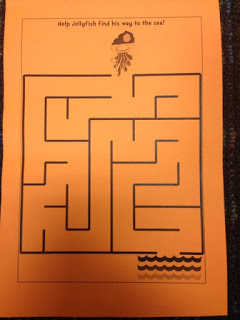 Some caregivers found the game sheet confusing, and it definitely wasn't the most patron friendly. Participation was ok, but it still wasn't quite what I wanted. Luckily, my lovely boss let me change the program again this year. 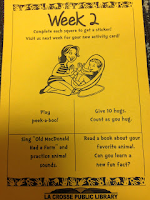 Introducing the new and improved Summer Reading Program for little ones! I chose to model the program directly with our school aged SRP. 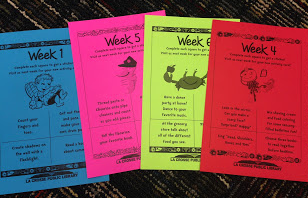 We sign the little one up and hand out a simple half sheets with 4 unique early literacy activities to complete each week. 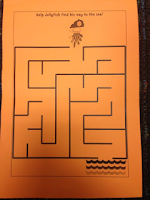 A fun activity for caregivers and children to do together, such as a maze or coloring, is on the other side. 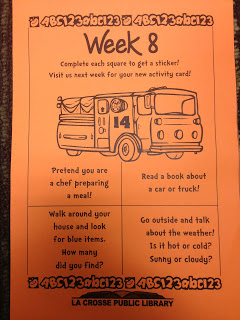 We have 10 weeks of SRP this year, so there are 10 different sheets to encourage weekly visits. We simply change the sheets out every Monday. 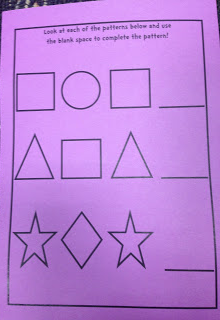 They need to complete at least 4 sheets to earn their free book, and now they have an official reason to come in and check out books each week! On each return visit children are given a sticker to cover our featured villain of the month and help save the library! Here is a closer look at a few of the half-sheets. Happy Summer Reading everyone! It's May! How did this happen so quickly? Hopefully everyone's snow has melted and you're all starting to see a little bit of sunshine this month. We have a great batch of submissions this week, so let's get right to them! First, we have a great song cube over at HeyThereLibrary. 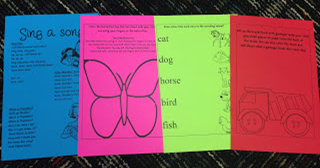 Such a fun inexpensive way to add some pizzazz to your storytime! Next, Danielle shared her beautiful frogs she uses with "Five Green and Speckled Frogs". Did you know that they've found the real life kermit frog? He looks a lot like these flannels! 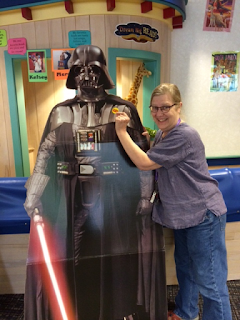 Kathryn over at Fun with Friends at Storytime, shared her amazing superheroes and a rhyme. I'll definitely be stealing this for summer storytimes. One Little Librarian shared her beautiful flannel suns! Perfect for our recent turn in weather conditions. Miss Sue shared her great flannel game of Dress the Cowboy! Perfect for any western themed storytimes. Lucky Jane over at Piper Loves the Library, got to meet another real life Flannel Friday person this week! Jealously was felt by all not in attendance. Finally, Storytime Katie wraps up this weeks post with an amazing flannel of Five Little Monkeys, inspired by the lovely Mel's Desk. Next week she's going to share how to do even more with these beautiful pieces! For more information about Flannel Friday, or to view past round-ups, check out the website! Or you can find Flannel Friday on their Facebook page or on Pinterest.